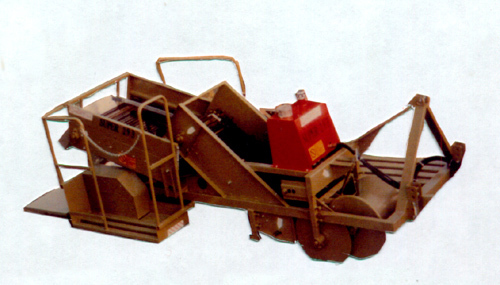 The Carlotti One Row Potato Harvesters are available in a 3 point hitch and a pull type harvester. They dig one row at a time and convey the potatoes into a bag or a bin. Potatoes are hand selected and put onto the unloading chain. Both harvesters are hydraulically driven so the speeds of the conveyer chains can be adjusted to match the speed of the hand operators. The Pull Type Model can dig the left or right hill that the tractor straddles by offsetting the drawbar of the harvester. The Pull Type also has rear wheel steering to help keep it running straight on hillsides.